Kelly Preston knew her husband had struggled with post-traumatic stress disorder born of his experiences as a Marine sniper, Boone County sheriff’s deputy and Newport Police Department SWAT officer, but it was a different kind than typically exists in the popular imagination: Cumulative, made up of a thousand pinprick-brief moments instead of a single, overwhelming traumatic experience. That’s common among first responders like Mike, she said. So is death by suicide, even if few feel comfortable acknowledging it. This story contains discussion of suicide and mental illness. If you or someone you know is struggling with thoughts of self-harm or suicide, you can call the National Suicide Prevention Lifeline (1-800-273-8255) at any time. If you are more comfortable texting, you can send a message to the Crisis Text Line at 741-741. Kelly Preston expected the world to stop turning in 2016, when her husband, 19-year law enforcement veteran and self-proclaimed “best cheer dad out there” Mike Preston, killed himself. It didn't. Only she and a few others stayed behind in a web of what-ifs and should-have-dones, trying to answer her 8-year-old son's questions about why his father had taken his own life. Preston knew her husband had struggled with post-traumatic stress disorder born of his experiences as a Marine, Boone County Sheriff’s Officer sniper and Newport Police Department SWAT officer, but it was a different kind than typically exists in the popular imagination: Cumulative, made up of a thousand pinprick-brief moments instead of a single, overwhelming traumatic experience. That’s common among first responders like Mike, she said. So is death by suicide, even if few feel comfortable acknowledging it. According to the PTSD advocacy organization Blue Help, 150 first responders died in the line of duty in 2018. More — 159 — took their own lives. She hopes to make them less afraid. A year after her husband’s death, she became an ambassador for Code 9, a group dedicated to educating and supporting the families of first responders grappling with PTSD. “It comes down to, ‘Who cares for the people who care for everyone else?’” she said. Jo Terry doesn’t belong to the same organization as Preston, but she belongs to the same club. Her husband, Chip Terry, worked for decades as a Covington paramedic and firefighter before retiring in 2012. She would realize later he had long shown warning signs of PTSD — signs she hadn’t known to look for. He had been “a true firefighter as they come,” she added. Retirement chafed. He began to drink and in July 2017 attempted suicide. Terry remembers visiting him at the University of Cincinnati Medical Center’s psychiatric ward. His doctors told him he had a guardian angel. They promised to help, but the outpatient program they recommended was intensive addiction rehabilitation, not treatment for PTSD. Neither Terry nor her husband knew enough to realize it was a bad fit. The couple celebrated their 31st anniversary Sept. 6. He graduated from rehab Sept. 9. He shot himself Sept. 15. Like Preston, Terry wanted to turn her grief into something that could help another wife who might otherwise find herself helplessly wondering what had happened. She established the Chip Terry Fund for First Responders and began speaking to others about the dangers of PTSD. In September 2018, she helped organize a seminar featuring national speakers on the subject. The stigma can still be intense, even among Covington firefighters she knew for the entirety of her marriage, but she feels confident that the atmosphere is changing. “One gentleman in particular, I talked to him the other day, he got back from the IAFF Center, and he said, ‘It saved my life,’” she said. “Those are the stories I’m going to continue to pound for, one first responder at a time. That’s my husband’s legacy. 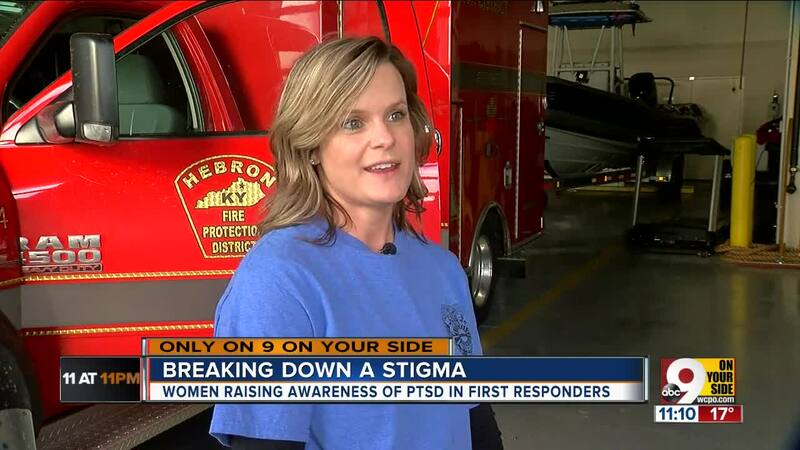 Hebron Fire Department EMS coordinator Tara Kleier didn’t lose a loved one to PTSD. She battles it herself, and the struggle makes her passionate about helping others. Kleier's department will host a seminar Friday from 9 a.m. — 3 p.m. at the Cincinnati Marriott for anyone interested in learning more about PTSD and suicide among first responders. This article originally stated Mike Preston had been a Marine Corps sniper. He did serve in the Marine Corps, but his time as a sniper was with the Boone County Sheriff's Office. WCPO regrets this error.